Henry, one of my students whose fall Northwest Evaluation Association (NWEA) results showed 20th percentile, is an outstanding example of how many of our students reacted to the program. Week 6: Henry squeaked out a 60% on the first two standards tested. I was delighted to respond, “Yes, Henry, you can.” Henry’s winter NWEA testing was in the 56th percentile. Henry has a solid B, regularly participates in class, and does most of his work. Plus, his behavior issues from the start of the year are long gone. And, Henry is not alone! Our students have thrived, growing confidence, perseverance, and competence. As the Algebra 1 team and our students reflect on the system, three big takeaways emerge. First, students feel better about practicing and making mistakes when the practicing is not held against them in the grade book. We used a sports and a music analogy to relate the idea to students. Teams practice every day, make mistakes, work out bugs, and experiment with new strategies together. Game day is when we get to see it all come together. I tell them that I understand the new work will take practice and I want them to feel safe to practice. I want them to be ready when we assess for proficiency. Of course, students and teachers still need formative data. 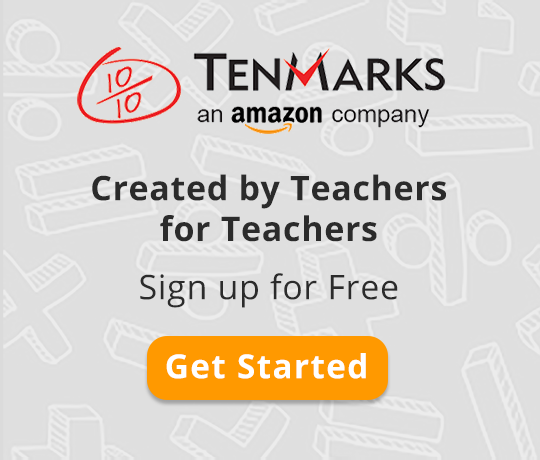 TenMarks does this brilliantly. When practicing, our students get real-time feedback on whether they are on the right track, and if not, why not. They don’t wait for me to grade papers first. From my perspective, the TenMarks data, which I get in real time, gives me both the big and small picture of where my students are so I can direct the next practice. Best side benefit? Students no longer copy each other’s work just to get a grade. Second, students tell me they like the way grades now measure how well they know a skill rather than punishing them for missing a deadline. As educators, we need to seriously consider what message we are trying to send with our grade book. Our students understand that giving zeros for missing assignments is, at best, intended to teach good work habits and, at worst, a punishment. Does this contribute to developing internal motivations and student self-efficacy? In our classroom, we practice saying that we don't know a concept yet. We talk about how we should see growth in our practice scores as we progress in our learning. We also use a learning log to track this growth. From the learning log, students develop plans for filling in the rough patches. This makes them the co-pilot in their learning. They are in control of their grades. I simply record how well they know a particular standard. If they had an idea backwards, they are motivated to go back and learn from their mistakes because they can come back and show me better proficiency, which I will happily record. I love that TenMarks makes this an easy classroom shift. With the assessments already made and internally graded by the program, I get to be a coach and teacher with my students rather than buried under a big stack of paperwork. Since then, they have been on fire to know and grow. It is normal now to hear a student ask if I could resend them a particular assignment because they think they get it now. Students asking for more work so they can get stronger?! How fantastic!